the learning and wellbeing gap between the wealthiest and poorest children is widening. There is a mismatch between Australia’s investment priorities and our opportunity to make a difference in the lives of children. We know that access to high-quality early education can change children’s learning trajectories. Yet one in three Australian children do not attend early education for the hours needed to make a difference. The children most likely to benefit from quality early education are the most likely to miss out. Five key changes are needed to improve access to high-quality early education to set all children up for a lifetime of learning. All children should be able to participate in a high-quality preschool program in the year before school – regardless of whether their parents are working or can afford it – in the same way that all children have a right to attend school. Access to preschool should be a legislated entitlement that all children hold, as is the case in many OECD countries, including New Zealand, the United Kingdom and most of Europe. Australia has done a good job in accelerating access to preschool education. Currently, 96% are enrolled, but 68% don’t attend for 15 hours a week, 40 weeks a year. Every state and territory takes a different approach to funding and delivery. Short-term funding agreements for preschool make it hard to boost attendance rates. Governments must make a permanent commitment to funding universal access for all four year olds, in the year before they start school. We must build on the work we have done to extend access for four-year-olds to make sure three-year-olds also have access to developmentally appropriate early learning. Children who received two years of quality early education perform better at school, with children experiencing disadvantage benefiting the most. We also need to invest in and scale up evidence-based, high-intensity programs for the most vulnerable children, targeting communities scoring in the bottom 10% in the Australian Early Development Census in each state and territory. Current policy settings are not working to reduce the impact of disadvantage on children’s outcomes. Data from the Australian Early Development Census shows a strong and persistent correlation between socio-economic status and developmental vulnerability. Programs in low SES areas that include vulnerable children “should be model programs of the highest quality”. But this is not always the case. Some children require additional investment and support to reach their potential. Children only benefit from early education when it is high quality . Australia’s National Quality Framework provides the foundations for making sure all children are able to experience a high-quality learning environment. 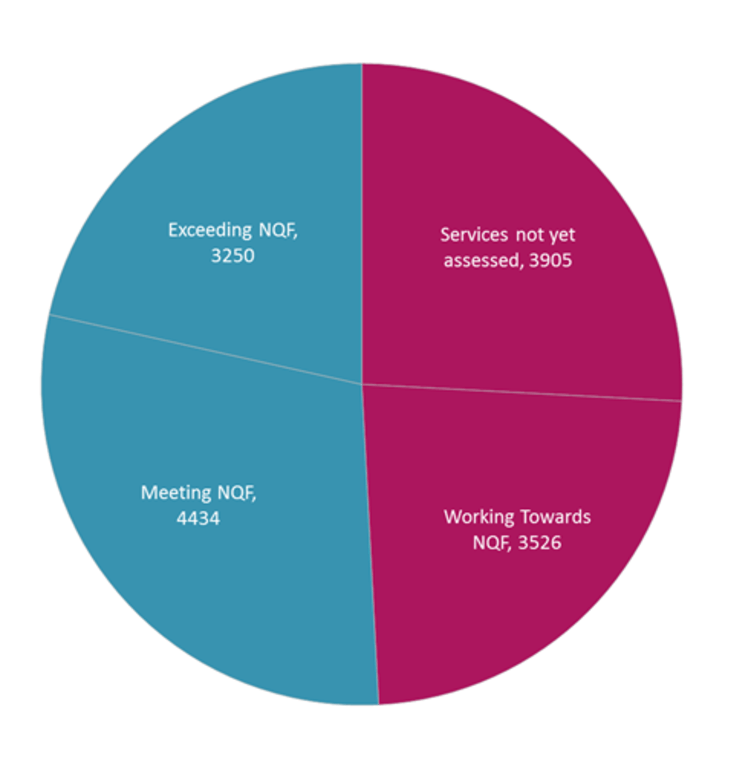 Currently, one-quarter of services have not yet been assessed. One-third of those who have been assessed are still working towards meeting the National Quality Standard. The quality area that services are struggling with the most is offering a high-quality and developmentally appropriate educational program. We need to ramp up levels of quality across the sector. All services should be required and supported to meet or exceed the National Quality Standard by mid-2017 at the latest. For governments and services to make good decisions about where their investment can have the greatest impact, we need clear and consistent data. The Productivity Commission Inquiry into the Education Evidence Baseis welcome, and should inform a national early childhood data strategy. We must establish the information infrastructure needed to drive policy and practice improvement into the future. All families and communities need to understand the importance of children’s learning in the early years. There are substantial differences between the way education experts and Australian families understand child development and early learning. In particular, while experts see early education as a critical site of development and learning, families often see child care primarily as a place where children are looked after safely while they work or study. A national campaign is needed to highlight just how important quality early education is for kids, not only for helping parents to work. Parents’ preferences and beliefs about children’s learning influence their decisions about whether or not to enrol their children in early education. High-quality early education is one of the most effective tools we have for changing children’s trajectories and making sure all children are ready to flourish in and beyond school. By not extending educational opportunity equally to all children we are missing out on chances to maximise their potential. This has long-term consequences for the future productivity and prosperity of our nation.